The Incredible Freedom Machines is a children’s picture book written by Kirli Saunders, illustrated by Matt Ottley and published by Scholastic Press (2018.) RRP: $Au 24.99 HB. I have previously reviewed Ottley's book, Tree. She was small when she heard about them... the incredible freedom machines. 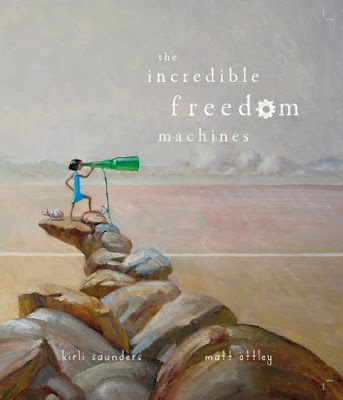 In this sumptuous story of exploration and breaking boundaries, a young girl uncovers her very own freedom machine: a vehicle that carries her to all kinds of wondrous places. Through this picture book we discover a world that is “sewn together by boundaries”. There's a child who wants a freedom machine of her very own to help her break down those boundaries, and fulfil her dreams. In the book, Saunders uses vocabulary that is a little challenging, which I think is great. We meet words like toilsome, unearth, abundant, persevered, unfurling. Reading and sharing books with kids is such a wonderful way to add to the language they routinely use, and to increase their comprehension. The theme of pushing boundaries, exploring and dreaming big is mature too, but I think the book can be enjoyed on two levels. Younger kids will simply enjoy the journey of the unnamed child and the illustrations. With older kids, adults could explore concepts like transformation and freedom. I can certainly envisage children’s enthusiasm for delving into the book’s themes and for designing or painting their own freedom machines. I know they will begin to wonder about what a freedom machine that can take us to amazing places actually is, and maybe realise why the child on the last page has a book in her hands. Ottley’s illustrations were done in oils. They are fantastical, atmospheric and quite simply stunning. I loved the machines themselves and his use of colour and light. This is a great text to use from a visual literacy perspective, with students being invited to decide on what the artist is communicating on each page, and what contributes to it. I'll be adding this review to my List of Picture Books with a Focus on Imagination.